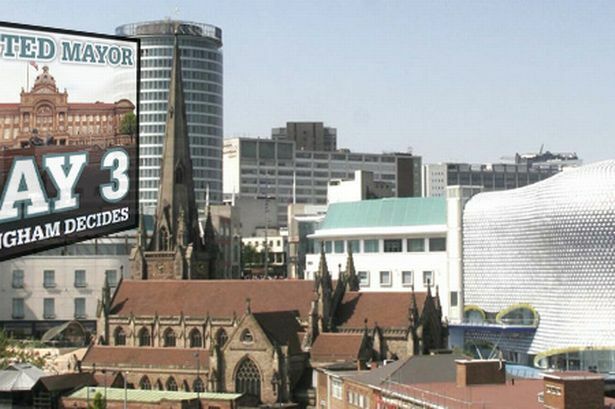 A poll of West Midlands voters has suggested that Birmingham could be heading for a ‘no’ vote in Thursday's elected mayor referendum. A poll of West Midlands voters has suggested that Birmingham could be heading for a ‘no’ vote in Thursday&apos;s elected mayor referendum. The vote on whether we keep the current council leader system or go for a directly elected mayor to lead the city will shape the political future of Birmingham for a generation. And, according to both anecdotal evidence and a recent poll, it appears that those in favour of the current council leader system are growing in number. The Guardian/ICM poll found that 64 per cent of voters in Birmingham and Coventry where referendums are taking place intend to vote no. City councillors and party activists, out campaigning for the local elections are also reporting growing hostility to the idea of a mayor. They say that people are increasingly suspicious of an idea put to them by political leaders like David Cameron and worried it will cost more. However, a YouGov poll found that 56 per cent of voters across the UK, not just in cities holding referendums, are in favour of mayors. Meanwhile, Conservative advisor on elected mayors Lord Michael Heseltine has told Birmingham business leaders that the referendum is a chance for revolution in the way the city is run and that a forceful mayor will be able to seize powers from the Government. He said: “It is about turning power back from London to you, the people of one of England’s great cities, one of the world’s great cities. “We want someone who says: ‘This is what we want, and we will make one hell of a fuss until we get it.’ That is the sort of city Birmingham once was, men and women and entrepreneurs fighting for what they want. With just a few hours until the referendum the yes to a mayor campaign are tomorrow night hosting a rally for volunteers and supporters ahead of their final push. The meeting is at the Sun On The Hill in Bennets Hill from 6pm.